When I left Hamburg airport, I was planning on heading to Flensburg for the derby in the Schleswig-Holstein Liga. TSB were top of the league, and entertaining neighbours Flensburg 08. These are the second and third best teams in the border town, as Flensburg also has a team one level above in the Regionalliga. The Sat Nav said 13.20 arrival when turned on, soon updated with ten minutes of delays in the many roadworks. Once I reached the roadworks, I was travelling slower than the Sat Nav predicted, and even on the small sections of open road, it is impossible to drive fast on busy German Autobahns. The predicted delays increased and my time was slow, so an hour into the supposed 1hr 25 minute journey, I was still an hour from my destination. Flensburg were kicking off at 14.00, Kilia at 16.00, so I took the turn, found the ground with plenty of time to head into town and grab a drink at the Kieler brewery. This meant that by the time Kilia kicked off, Heider would know that TSB had lost their game, so Heider were level on points before starting. First the ground. It is classic and old, but with a few new additions. 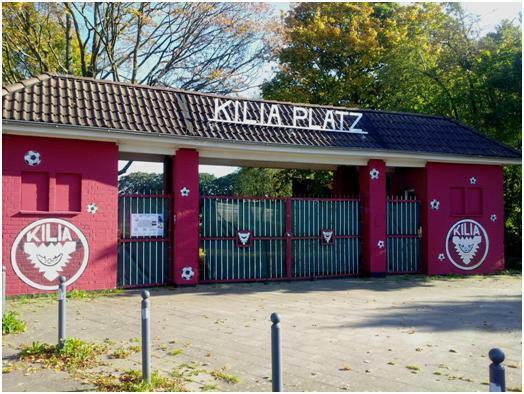 It has a classic entrance block, with the name Kilia Platz picked out above the gates, but this, along with a dressing room block on that side of the pitch is no longer used. Entrance is now from the small car park,the Gaststatte is also on that side of the ground, with the dressing rooms underneath. The ground used to have a few steps of terracing on three sides (not behind the far goal), with a classic stand sitting above the terrace on the West side. They have now added an area of decking in front of the clubhouse, with beer and wurst being served there, and a large block of uncovered seats next to this. Both of these cover the terrace and need to be traversed when walking around. The €5 entrance is for anywhere, so this is OK. 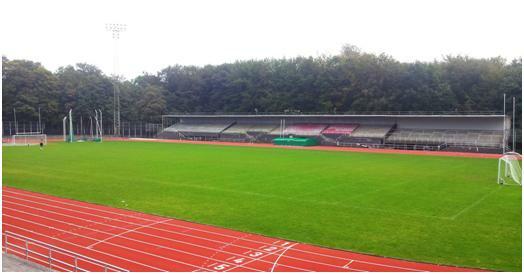 The open seating, unusual in German football appear to be because the ground is also used by the Kiel Baltic Hurricanes in the German Football League (as in American Football). No programme, I was directed towards the dressing rooms when I was looking for a team list, only to be sent away by an official down there. However, he turned out not to be a jobsworth as one of his colleagues came up to the bar and handed me a sheet within a minute. Onto the game, and it was not a bad one, although up to half time I thought it could be goal less. The visitors had by far and away most of the possession, but could not find a clear opening, with most of their shots being rather wayward, while their goalkeeper was forced into action on several occasions. The decisive moment came at the end of the half, Tobias Hass received the ball in space, and tried to go around the home keeper. The keeper dived but missed the ball, taking Hass out. Clearly a penalty and a goalscoring chance, so the red card was shown. The last kick of the half saw Hass score the penalty against stand in keeper Niklas Lott. Kilia did not have a keeper on the bench, Lott having played the first half as left back. A substitute left back came on at the break, and Lott continued to keep the goal. Despite this, Heider could not up their game, and the ten men even created a few chances. Lott made one fine double save and the score stayed at 1-0 until the 81st minute, when David Quade took advantage of Kilia not clearing the ball to head in at the post. Heider were awarded a second penalty when the extravagantly coiffured Mark Lafrentz was brought down on the edge of the area, but this time Lott dived to his right and pulled off a fine save. Sunday dawned bright and foggy. I still headed down to Schleswig without leaving enough time to switch to the alternate game if the weather continued in the same bent. Fortunately, there were no problems. I had never been to a Kreisliga game before, two efforts to do so in Aachen had both failed, once because the fixture time shown on fussball.de was wrong, the other because the venue was incorrect. In both cases, the ground was such that I did not feel I had missed anything. 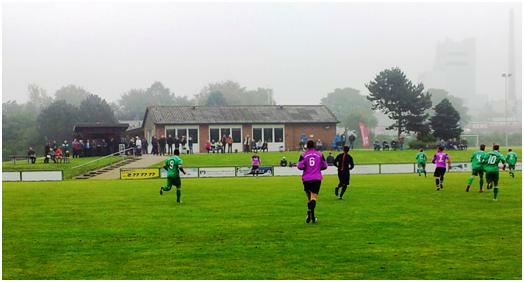 In Schleswig Holstein, there is no Bezirksliga, so Kreisliga is the 7th level, while in most of Germany it is one or two levels lower. Generally, Kriesliga is an indication of the geographical area the league covers, but I had assumed the quality of grounds and football would be similar. 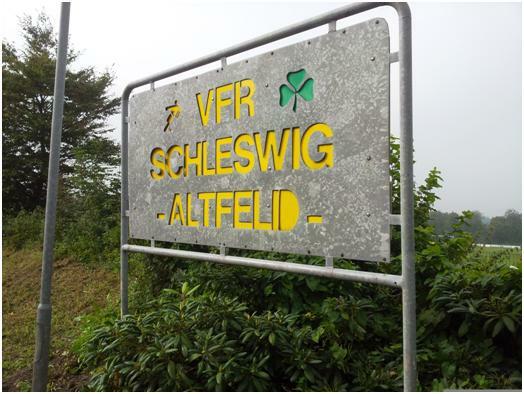 If this is so, then I struck lucky at VfR Schleswig. On arrival, the ground has club house, car parking and an entrance gate where €3 is taken off those watching first team games. No programmes though. Inside there is a clubhouse and a food stall. I was surprised to pay just €1.50 for my bratwurst. The team list was a problem, not because they had any objection to me seeing it, but because they could not get their computer to work. Having made a prior check that last week’s lists had been published on fussball.de, I settled for the numbers on the player’s backs at the start, but when I saw the officials had managed to print out a couple of copies and were taking them around to each club’s dugout, I managed to photograph one. The main pitch has rails on both sides, but is open behind both goals, meaning the goalkeepers have to collect the ball quite frequently. All the pitch surrounds are grass. On the clubhouse side, there is a grass bank (no reported injuries) leading up to a patio in front on the clubhouse. This paved area boasts three wooden park benches, while two more are situated to the sides. Additional seating was in the form of a stack of plastic garden chairs, which spectators could select and position in any free space. 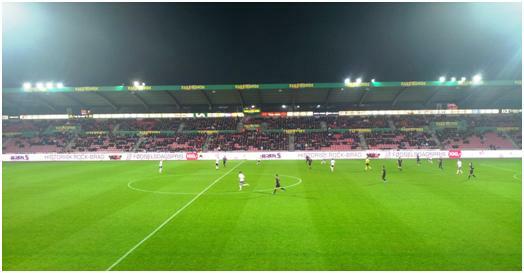 I made the crowd to be about 85, quite a few of which came from the visitors, FC EIlligstedt-Silberstedt. It was clear from the start who was the better team, and while VfR tried to match the visitors, it was never going to be close. With a little thought for sequencing, FC E-S scored goals in the 9th, 19th and 29th minute of the first half. Finn Johansen got the first from close range, Marco Clausen added the second with a good finish from a tight angle on the left, and Yorrick Theeman added the third. It was no all one way, but few of the home sides attacks looked dangerous, until they won a 37th minute penalty, which Dennis Winda converted for 3-1. Schleswig missed a golden opportunity to make it 3-2 before the break, which turned out to be their last chance to make a go of it. Three minutes into the second half, FC E-S were awarded a penalty, and Timo Semmler made it 4-1. While in the first half it was on the nines, in the second half it was within nine, as by nine minutes after the penalty was awarded, both Johansen and Clausen had added to the score and it was 1-6 with more than 30 minutes to play. As often happens, the winning team slackens off after taking such a lead, and this was no exception. They made their allotted substitutions, leaving Semmler as the only visiting goalscorer on the field. So we did not get a further goal until four minutes from time when Christoph Rennhack brought the numbers back to 6-2. Not surprisingly, this was a late consolation and the final goal. 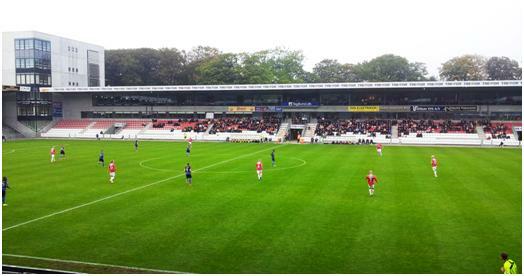 Now I had a decision to make – German Regionalliga in Flensburg, or Danish 1st Division in Vejle. For those that do not follow Danish Football, the 1st Division is the second division, unlike countries such as England (where it is the third division), let alone Switzerland (where it is both the 3rd and 4th divisions). With the Danish game kicking off later than the German one, my Sat Nav had me arriving at either venue around 40 minutes before kick-off. I chose Denmark, but soon regretted the decision. While there were no road problems, stops at the first two service stations in Denmark confirmed that one can neither change money, or use ATMs here. That meant I had to go into the town centre and find an ATM. Generally, this is not a problem but of course once you are looking for a bank, you cannot find one. I never did spot a bank in Velje, but eventually found a machine on drew out 400 DKK, more than enough for the day. 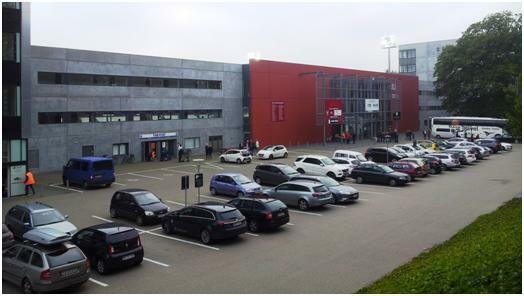 Parking at the ground was easy, I managed to find a spot on Stadion Vej, just two minutes walk from the ticket offices, which are situated between the old and new stadiums. I now suffered (for that is the word) with two pieces of luck that ended up saving a little money. Firstly I went to the first ticket window, (just as they were about to close) and bought the first ticket I could. This cost 70DKK (about £7), but was behind the goal. If I had taken time to read the displays, I would have bought a 100 DKK ticket along the side. As it was, having found myself in one section, I asked to buy an upgrade and was let through for no extra! Secondly, the programme sellers had already disappeared and I could not get one until the end of the game. When I asked at the offices at the end of the game, I was given one without charge, (another 10 DKK saved). I would have willingly paid all the extra money and more for a decent game, as this match was tedious in the extreme. Firstly the stadium, which I actually did not see as I drove past it. 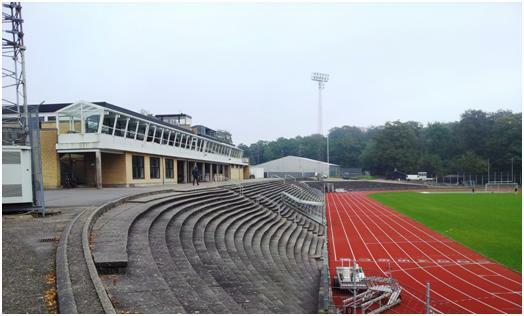 The floodlights are not as tall as the neighbouring Athletics stadium (which staged the game of my earlier visit), and from the road, one could believe it was a low lying office building with two square tower buildings, a storey higher at each end. The offices were the club offices, while the two towers were corners of the stadium and I think are let out as commercial buildings. The other three sides were a continual uniform height single tier with 17 rows of seats. The roof of the main stand is of a height with the other sides, but less rows of seats, allowing for boxes behind. The stands curved around the two corners without offices. Behind each goal, the stand was broken by a dividing line about half way. In each case the half closest to the road was standing accommodation with seats in the other half. For this game, one end section was entirely empty. I did not see an away fan until the end, and when I mentioned this, I was told they numbered about 10. Probably the only ten people that were happy with the day’s fare. The Danish League is being restructured from next season. Currently the top two divisions are 12 teams apiece, with the teams playing a 33 game season. Next season the Superliga will have a 14 team division, taking its lead from the Belgium top division. After 28 games have been played, the top six go into the Championship play-off round, playing a further 10 games each. The other 8 will be divided into two groups of four, playing 6 games each. Each team in these groups plays at least two more matches in knock out play. Meanwhile, the teams that finish 3rd and 4th in groups C&D play off against each other, with the two winners then playing each other in one game, the two losers in the other, giving a final classification of 11th to 14th places. 11th stays in the Superliga, 12th plays-off against the team that finished 3rd in Division One, 13th plays-off against the Division One runners-up while 14th takes the drop directly. I guess by creating more games, and in particular more games of importance, the league can sell the rights to the TV companies for more money. I have yet to meet a fan of a club in any country with a convoluted system like this that actually prefers it to the standard fare of home and away sequences, and with the seventh and eighth placed teams in the initial series of games having a better chance of reaching the Europa League, there must be a feeling of injustice from supporters of teams who just miss out on a European play off. All this means that there are three promotion spots up for grabs this season, with no play-off. A golden ticket for a team like Vejle who lie in third place at the moment. This week’s matches are the 11th of a 33 match season, meaning after the games, everyone has played each of the other teams once. 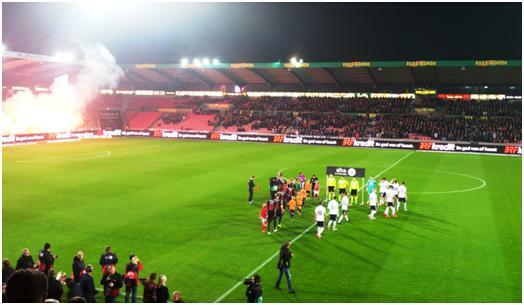 Vejle were unbeaten at home going into the game, while HB Koge did not have an away win to their credit. The match was as dull as any game can be. There was no end to end play, but Koge were clearly the better of the two. They eventually scored just before the hour mark with Kristoffer Munksgaard getting his head to a right wing cross. Everyone (including the home support) were bemused about protests about the goal, which seemed to be “how is this to be allowed, they have no right to score”. Vejle did not improve and Koge were closest to scoring again, with Faeste making one good save, (the only one in the game), and Rasmus Nielsen firing a shot against the post. All in all, though this was a game that did not live in the memory for the whole time it took me to return to the car. It must be said that my previous visit to Velje has also escaped my memory, the old stadium did not allow me to recall anything about the game, perhaps this was also a dull game following a much better one. Certainly I can recall going to AGF earlier in the day to see Kobenhavn win 5-3, before Viborg won 3-1 at Vejle. 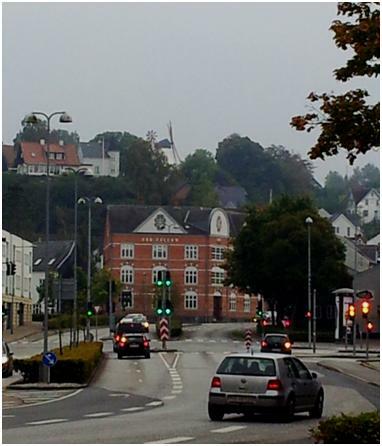 With time to kill, I took brief looks at the town centres of both Vejle and Herning before heading to my night game. I may be doing the places a disservice, but both towns are on the “nice place to live, but I wouldn’t want to visit” list. They have good facilities – shops, restaurants, theatres, (Herning has banks), but I saw nothing that inspired me during me brief time wandering through the towns. If I ever come to these parts as a tourist, it will be to take the boy to Legoland, and not for anything special the area can provide. In actual fact, one of the main draws for visitors to Herning is the Messe Centre Herning, (or MCH). I normally search for alternative names for stadia which appear to have sponsors names, but the MCH Arena is simply the Arena at the MCH, so it will remain as MCH Arena in my log. I note it did run as SAS Arena for five years in the past, but it was MCH before and after this. This looks like a football ground from the outside, and cannot be confused with the exhibition halls around it. I particularly like the curved floodlight pylons. I was also pleased to note that for a stadium a couple of miles out of town, car parking was free. After the game, the stewarding was good, and I got back to the motorway within minutes. Inside it was bland and modern. 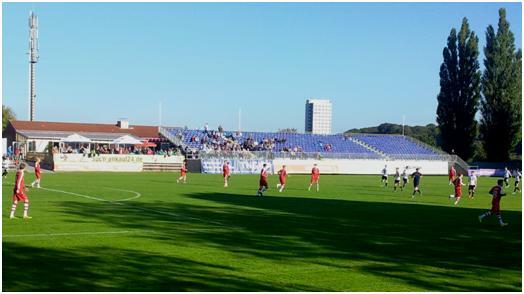 In a similar format to Vejle, the stands all around were of uniform height, with a less rows of seats on one side, to allow for sponsors lounges behind. In this case, all four sides have the corners filled in, although the lower rows of seats are missing to give access routes to the pitch. Tickets can be bought on line, or at the stadium. There was no shortage of empty seats. Prices for the long side of the pitch were 135 DKK. Again there are standing sections behind each goal, with half of each end given to seats. The AGF fans were given one end of standing, and with Aarhus being relatively local, they were numerous and in good voice. They even managed to let off a few flares before the game. The Programme was a pocket sized affair, given out free on the turnstiles. It has been folded into a fifth of its length and opens out into a single long sheet, with ten “pages” – only one has text, another has the teams, one is a front page, while the rest are fixed content, mainly listing sponsors. 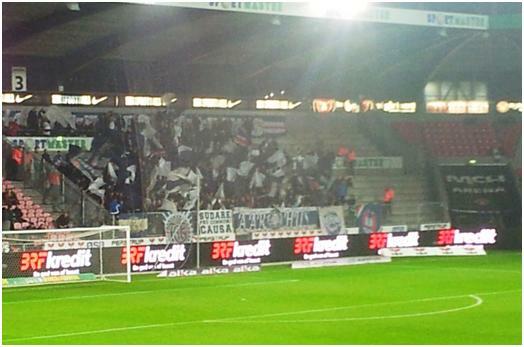 FCM were formed in 1999 by a merger of Herning Fremad and Ikast. They are the current champions of Denmark, their first title, and lead the league again. In the ten league games prior to my arrival, FCM had scored just 12 goals, conceding 3. In the Champions League, the Gibraltar team Lincoln Red Imps were beaten 3-0 on aggregate, but they went out on away goals to APOEL of Cyprus. This gives the team a second chance in the Europa League play-off, and they took this well with a 2-1 aggregate against Southampton. I saw the match in Southampton and also their visit to the New Saints, in the 2011 Europa League. 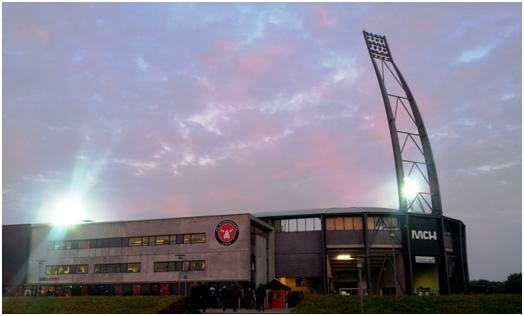 Midtjylland have won their opening two games in the group stages, with a 3-1 win last week in Brugge being the second time they have hit three this season, (the other being a Danish cup tie at Naestved, the bottom team from the lower division). With plenty of crowd noise, and a faster pace on the field, the game has more going for it from the start, but one soon realises this is a veneer with very little behind. Midtjylland play a 4-1-4-1 formation designed to frustrate their opponents, but they have little in the way of creativity. They can get the ball out to the wings well enough and they attack with plenty of width, but there the game plan ends, as the ball is booted into a central area where no one is there to meet it. Onuachu is the one man up front, but he seems to have been picked for his size (6 foot 7), rather than speed or skill. He did manage to flick a good chance just wide in the 13th minute, but most of the time he failed to get close to the ball, or his midfield support had not moved up to collect a knock on. FCM rely on dead ball situations as the only times they have more than one man in the box and can really threaten. AGF play into their hands by conceding free kicks in the right places, as well as corners, while long throws are also a threat. When FCM go ahead on 30 minutes, it owes more to AGF than their own prowess, a long throw comes into the six yard box, where the keeper goes up to punch the ball under pressure from his own defender. His touch sends the ball the wrong way, behind him and towards the far post. There is still a defender with a chance to clear, but he makes no contact and Royer taps gleefully knocks the ball into the empty net. When I saw FCM at Southampton, they achieved their aims by stifling the home side and having a little bit of luck to score. They were aided and abetted by the Saints’ lack of tactical nous, with the home side returning to the 4-3-3 formation that had been so ineffective in the first half after 15 minutes of 4-4-2 after the break had put FCM under the cosh and resulted in Southampton equalising. While AGF also play 4-4-2, (maybe 4-4-1-1), they never look likely to open up FCM from the flanks, and hence once the home side had taken the lead, one always felt the game was only heading one way. But then Marcos Urena comes on as substitute for the lumbering Onauchu. This immediately adds more pace and more promise to the Midtjylland attacks. Five minutes after Urena comes on, he receives a ball flicked over a defender by Dueland. Urena demonstrates a skilful first touch to control the ball, and then takes it past the goalkeeper before finding the net. It is the little piece of magic the game has cried out for. This appears to be the catalyst the game needs, and for a short while, one could believe that they could score three at home for the first time this season, but the head of steam soon run out, and with AGF capable of nothing more than occasionally making the ball bounce in the penalty area, it is no surpise that a 2-0 final result ensues. Its then onto my day job for five long days in Bremen. My week finished with a plane delayed at an hour back at Hamburg airport, thanks to a leaking toilet! That sort of thing annoys me – not so much the delay, we could see the plane on the ground with water from the leaking pipe dripping from the fuselage, but the absolute refusal of the airline officials to give information about what the problem was or how long the delay might be. Only the pilot’s message told us why we were delayed, and I think that was only because he had to let us know the forward toilet was out of order. You are currently browsing the Football Shaped blog archives for October, 2015.